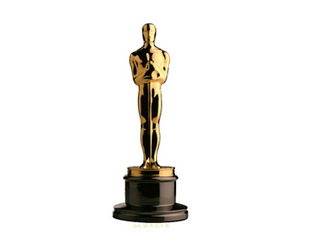 ﻿ Irish Film Institute -Who will bag a golden man at this year’s Academy Awards? Who will bag a golden man at this year’s Academy Awards? The awards season will reach a crescendo on February 22nd with the 87th Academy Awards. The competition is wide open, so can YOU guess who will win the top 6 gongs this year? Have a go at our online poll and you could win a pair of FREE tickets to an IFI screening of your choice* plus a copy of Oscar-nominated The Grand Budapest Hotel from the IFI Film Shop! We’ll randomly choose one person who correctly predicts the Best Picture, Best Director, Best Actor, Best Actress, Best Supporting Actor and Best Supporting Actress prizes. Simply enter your predictions below with your name and email. The winner will be chosen randomly from the correct answers on Monday, February 23rd. Good luck! Don’t forget to check out our very own Oscar in the glass case in the IFI Foyer on your next visit! It was donated by renowned set designer Josie MacAvin (along with her Emmy statuette) which she won for her work on Out of Africa (1985). UPDATE: We’re receiving feedback that some of you see an error message when entering the poll – please ignore the web gremlins, all your entries are being recorded! We’re investigating the issue now..
Competition closes 21.00 Sunday February 22nd, 2015. Any entries received after this time will not be included in the competition. * This prize does not include tickets to IFI Education events, Feast Your Eyes or any other ‘Free List Suspended’ events. ‘Any time’ film tickets are subject to availability.